13-gauge knit liner allows maximum breathability and reduces hand fatigue for all-day comfort. 1. Fine 13-gauge knit liner allows maximum breathability and reduces hand fatigue for all-day comfort. 2. Innovative flexstoneTM engineered liner provides super cut resistance and excellent dexterity. 3. Meets EN407 Contact HEAT LEVEL 2,EN388 LEVEL 5, Cut Resistance and LEVEL 4 Abrasion Resistance. 4. meets food grade and absolutely safe for use in the food industry. 5. 1 layer silicone coating plus 1 layer silicone dots provide protection from high-temperature oil & gas and a superior grip. 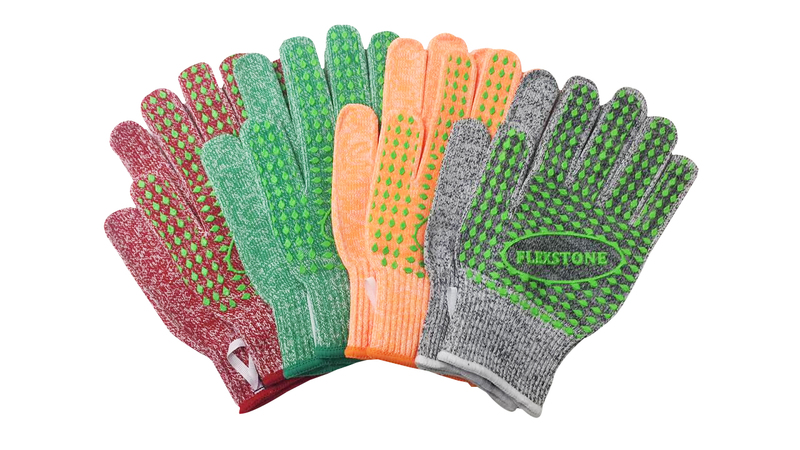 6. durable glovem material is hand and machine washable. convenitent hang ring fixed on each glove wrist. 7. avaliable in 4 color coded sizes.